BIKER GIRL OF THE WEEK!! 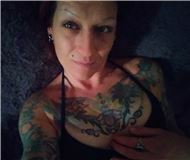 Female, 38 years old, and single. Birthday is April 09, 1981. Owns a motorcycle. Interested in males. Looking for friends or a relationship. Religious view is Spiritual, not religious.. Drinks socially. Conservative political views. Lives in Surrounded by corn, Illinois United States. Member since August 2018. Last online last month.